Making a solar charger for an iPod is no more difficult than making our Solar battery charger. Built in iPod batteries are 3.7 Volts with the capacity (measured in mAh) dependent on the type of iPod – e.g. 1,200mAh for a 2nd Gen, 850mAh for a 3rd Gen, 500mAh for the Mini iPod, and 400mAh for the Nano. In our instructions for making a solar battery charger for AA and AAA batteries we made a current limiting circuit. Because the iPod range has batteries of a wide selection of capacities, our solar iPod charger is instead voltage limited. Since iPods can be charged via a USB port with a fixed 5 Volts DC, this is the voltage we will use. Please scroll down to the bottom of this article for details on commercially available Solar iPod Chargers if you are not interested in finding out how to make your own. To make our iPod solar charger we used a 250mA 6 Volt Solar Panel (available in the REUK Shop). Even in the brightest sunshine the voltage is not excessively above that of the iPod battery, and the current is plenty enough to charge the battery in a few hours in bright conditions (even in the UK!). A blocking diode should be used (in the positive solar panel lead) to prevent the iPod battery from slowly draining at night if it is still connected to the panel. Unfortunately this results in up to 0.7 Volts being lost as heat in the diode, so it can be left out if you prefer to have a faster charger which will charge the battery in lower light conditions. 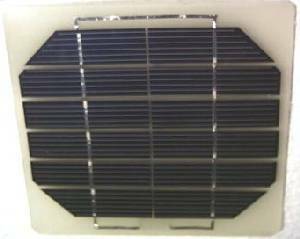 Note that many solar panels are supplied with a factory fitted blocking diode. Since our desired charging voltage is 5 Volts, we see that ideally R2 would be 270 * ((5/1.25) -1) = 810 Ohms. This is not a standard resistor size, however we had an 820 Ohm resistor which should result in an output voltage of 5.05 Volts. Wiring up the above circuit on a prototyping breadboard with a 270 Ohm R1 resistor, and 820 Ohm R2resistor we can confirm that the output voltage is 5.06 Volts – perfect for our iPod charger. It is essential to check that the output voltage is around 5 Volts using a suitable multimeter before attempting to charge your iPod or the battery and/or iPod itself could be damaged. It can often be cheaper to buy a cable with a fitted female USB-A connector and cut it off to use in this project. 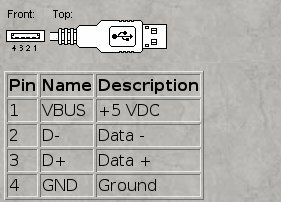 Simply connect the red USB cable wire to the 5V positive output from the LM317T, and the black USB cable wire to the ground (negative). 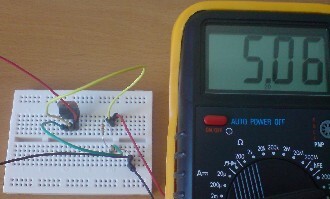 According the chart below the 5 Volt output from the LM317T should be connected to pin 1, and the ground (negative) connected to pin 4. …however when we made those connections using a scavenged male USB connector plugged into a similarly scavenged female USB connector the voltage output was zero. After a bit of fiddling around we found that connecting the ground to pin 3 (rather than to pin 4) resulting in the expected voltage getting through as shown below. Unplugging the test male USB connector and plugging in the male USB connector from the iPod, the charging icon appeared on the display indicating that our charger worked. Now all that remains is to solder (or otherwise join) the connections to make them permanent. The whole small assembly can simply be superglued to the back of the solar panel, and the iPod cable plugged into the female connector as and when necessary. Disclaimer – This is just a demonstration of how we built our solar powered iPod charger. We are not responsible if in following in our footsteps you damage your iPod. There are now a few high-quality commercially available solar chargers supplied with adapters to enable direct charging of many mobile phones, hand held devices, and the full range of iPod models (except iPod nano). These include Solio Solar Charger, PowerMonkey-Explorer (pictured above), andFreeloader Solar Charger. These commercial chargers feature a small solar panel and an onboard rechargeable battery which in turn is used to recharge your iPod or other device. Prices start from around £25 for the Freeloader up to £50+ for the Solio and PowerMonkey.